I don’t like Bangkok Tuk Tuk’s, I don’t use them. What’s the benefit of riding in a Tuk Tuk? They have no air-conditioning, they cannot navigate between cars like a motocye, you are sucking exhaust fumes while sitting in traffic, their motors are loud and they pollute. Tuk Tuk’s don’t have meters, so each fare is negotiated and usually misunderstood; somewhere there must be a picture of a Tuk Tuk next to the word ‘tourist trap’. Harsh? I think not, a Tuk Tuk is a novelty for tourists that becomes a low level annoyance avoided by locals. A caveat to my Tuk Tuk avoidance- Songkran. 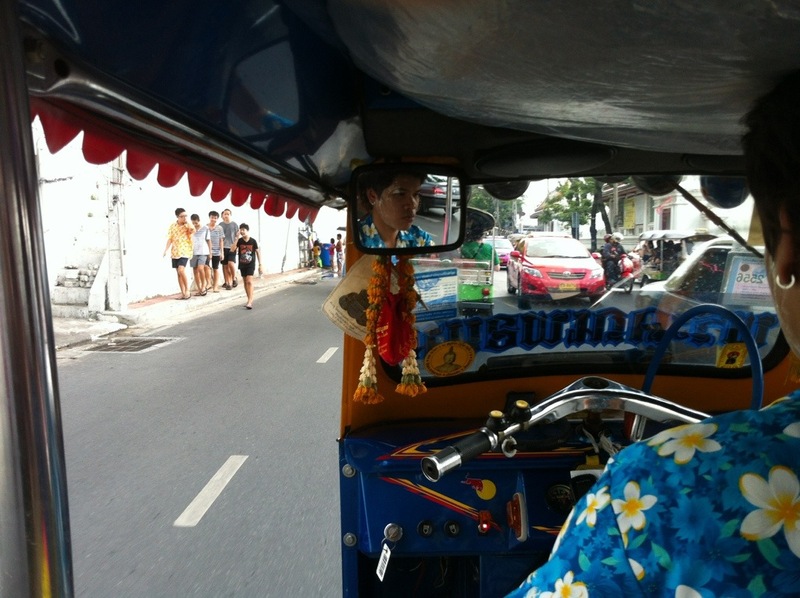 The Tuk Tuk is ideal for Songkran and based on my recent experience, so is the Tuk Tuk driver. What better than an open air vehicle with a driver that doesn’t care if loads of water are splashed into and on his vehicle? My friends and I piled into a Tuk Tuk for a journey across Bangkok on the first day of Songkran with out ‘play water’ supplies: beers, squirt guns and extra water for re-loading. The beauty of the Tuk Tuk during Songkran: the water battles as you drive. Within three minutes we were all cold, wet and laughing as we were roundly defeated in our first water battle- a large pickup truck with at least twenty people and loads of cold water was next to us while stopped for a red-light, we got soaked, there were 2-3 inches of water sloshing around in the Tuk Tuk. The Tuk Tuk driver managed to help us during subsequent battles, positioning the Tuk Tuk to inflict direct hits on other Tuk Tuk’s while stopped at red lights and even driving. Songkran is the one time of year Tuk Tuk’s become the ideal mode of transpiration for anyone that wants to get across town while continuing to participate in the Songkran festivities. 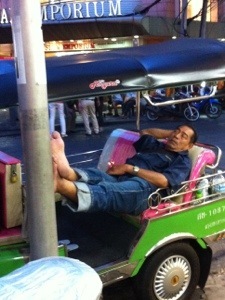 This entry was posted in Sightseeing and tagged Bangkok, Songkran, tourists, tuk tuk. Bookmark the permalink.